In this issue we look at some roads mentioned in charters of Arbroath Abbey, a pontoon bridge constructed by Edward I over the Forth, the OS Name Books, and an unusual feature on Coldingham Moor. While the main evidence for long distance routes in Forfarshire and Kincardineshire comes from the Itinerary of Edward I and the Mounth Passes, these charters provide useful evidence for more local routes. They do offer indirect evidence however for long distance routes by their mention of a ferry at what is now Broughty Ferry where there was a hostel. This would have served Dundee and implies a coastal route to Montrose, where there was another ferry. Just south of Aberdeen, a ferry crossed the Dee at Kincorth. The nearby Bridge of Dee was completed in 1527 with the Causey Mounth from the Stonehaven area leading to it. This in parts was an actual road, laid down across some particularly boggy ground rather than a "beaten track." A "king's highway" led south-east from Forfar through the King's Muir to a place called Ochtirlony. From this there was a road over towards Leitham as well as some fords and a "green road" that were probably very localised. The "road to the mountains" would presumably have come from Aberdeen and headed north-westwards. It came past leyn and conueggy. The green dots show part of a parish boundary and in part may show the "road to the mountains." Based on half-inch OS map, sheet 15, with thanks to OS. 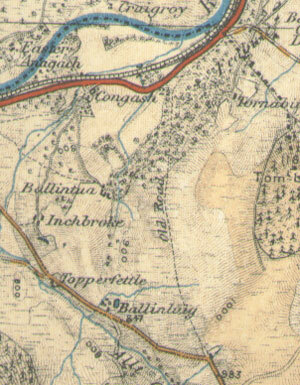 More interesting is the "Fyschergate" and the "white road" near Rescobie Loch, east of Forfar. There is a strong possibility the Fyschergate is the King's Cadgers Road said to have run from Usan to Forfar to allow fresh fish to be supplied to the royal court. The location of the white road is more uncertain although there is a length of road along which a parish boundary runs. second may reflect the uneven terrain of the Kaims of Airlie that would force a winding path on travellers. Two bridges are mentioned at Marykirk, one of them made of stone; and further north in New Machar parish in Aberdeenshire there is an intriguing "road to the mountains." In his campaign of 1303-4, Edward I ordered the construction of a pontoon bridge which would allow Stirling Castle to be bypassed by crossing the Forth downstream of the castle. There were ferries but these would be inadequate to support an invading army. Work began at King's Lynn on this huge undertaking with timber and other materials being brought in from all across England. Three hundred pontoons were made and required 30 vessels to transport them north. It is not known where it was used although it could easily span the Forth upriver from Kincardine. It may have been near Alloa as Edward, when he crossed it, spent time at Clackmannan. Oddly enough, a contemporary chronicler says that the bridge was not used. Used or not, the bridge ended up in storage at Berwick until Edward ordered it to be brought to Blackness and presumably Stirling while the castle was invested. When it was no longer needed, it was broken up and the materials used in various building works underway at that time. It may not have been the first time a pontoon bridge was used in Scotland. Two coins dating from the time of the Severan invasions of 208-11 show a pontoon bridge and a fixed bridge which are thought to have crossed the Forth and the Tay though it is not certain which river each one crossed. Of the sites surmised for the Forth one was at Queensferry and the other near Alloa. The latter is interesting in view of the tradition related by Jocelyn in his life of Kentigern who is said to have crossed the Forth here by the Pons Servani. As Kentigern lived in the late 500's, it is quite conceivable that a Roman bridge could have survived until that time. See here under Alloa. See also N Reed, The Scottish Campaigns of Septimus Severus, PSAS, Vol 107,(1975-76), pps 92-102. The OS Name Books are currently being digitised and made available on the Scotlands Places website. They list all the placenames appearing on the 1st edition 6" maps along with their associated map sheets, both 6" and 25". Of particular interest are comments on placenames which can supplement useful information from the Statistical Accounts, Chalmers, and other sources. As an example, the puzzling Captain's Road near St Mary's Loch is so called after the local landowner who had it made when he was a Royal Navy captain rather than, as might be imagined, a road used by moss-troopers. An "old road" south of Cromdale. Based on 1" Tourist Map of Lower Strath Spey, 1921. With thanks to OS. Being in digital form it is very easy to search for generic terms like Roman road or old bridge as well as named roads and bridges. The listing of map sheets on which a name appears makes it easy to see what route was followed. So far some 19 counties are available with the remainder expected to be available by summer 2013. Access is by subscription, currently £15 for 3 months. See ScotlandsPlaces website for details. Also available are tax records for carts, carriages, farm horses and carriage and saddle horses. Coldingham Moor - "Old Road"
A 6 inch map for Berwickshire (sheet v,series 1) shows a feature on Coldingham Moor which it notes as an old road. The feature runs for approx. 1100 yards from an old track up to the parish boundary where it turns WSW for another 100 yards or so. The NMRS record (NT86NE 7) notes it to consist of 2 shallow ditches 7 metres apart with no signs of ever having been used as a road. Angus Graham examined the feature in a paper Archaeology on a Great Post Road, PSAS, Vol. 96 (1962-63), where on page 323 he thinks it may have been the preliminary course of a road but never completed or used as a road. Based on 1" OS map for Eyemouth, 1903. With thanks to OS. 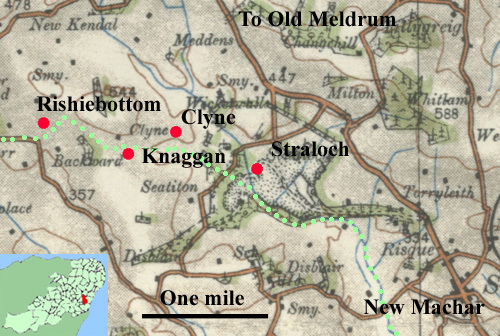 As noted by Graham, there does seem to have been an early route in this locality that came directly from Coldingham rather than by the main route north from Berwick and Ayton by the Press and Old Cambus, that lies one mile to the south-west. Although obscured today by forestry and general disuse, parts of the Coldingham route remain, particularly an enclosed track north of Silverwells. It ran up to join the Dowlaw road from where Old Cambus could be reached. This site contains back issues of the FNH Journal, some of which include papers on roads and bridges. Among these, volumes 17 and 20 contain papers on the old bridge of Stirling and there are two papers in volume 31 by Ron Page, viz. Stirling, Gateway to the North: I Roman Roads and Early Routes & II Ancient Drove and Military Roads. The paper on the Bridges of the Forth and its Tributaries by Louis Stott (vol. 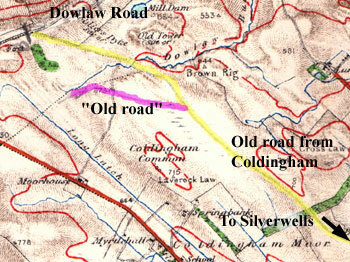 22) was noted in the previous Rambles on Old Roads. The paper on Airthrey Roads: Captain Haldane's Magic Roundabout (vol.9) is not online but can be found in Stirling University library and some public libraries in the area. "Rambles on Old Roads" will be produced four times a year.